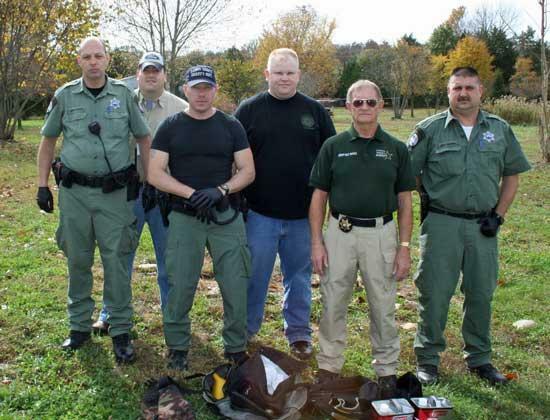 From left are Deputy Anthony Young, Investigator Vance Walker, Deputy Patrick Fann, Lt. Brad Hall, Sheriff Billy Nichols and Investigator Charlie Wilder of the Cannon County Sheriff's Department. Cannon County Sheriff Billy Nichols and his department executed a search warrant in the southwest area of Cannon County Monday morning and uncovered a large methamphetamine lab. "This lab was simple in design, but extremely dangerous in nature due to the volatile and explosive materials used in the manufacturing process," stated the Sheriff. "My lab certified officers worked several hours in the dangerous environment in order to break down the process and make the lab safe for removal and disposal." There was a lot of waste product generated in this lab and it took a Haz-Mat crew quite some time to package and haul away the discarded materials. One suspect was arrested at the scene and warrants are outstanding for other suspects, but it is expected that all involved will be arrested soon.